Alex Dowsett can breathe a sigh of relief as his British record for the 10-mile time trial remained untouched by Sir Bradley Wiggins at the City RC event as the world champion clocked a time of 17:58. With the race delayed by 45 minutes while a precarious lamppost, swaying in the gusty winds, was made safe Wiggins was made to wait for his moment in the northern sun. It was possibly those winds, however, that stopped Sir Brad posting a record time of under 17:20, even though he passed a number of the riders to start before him. 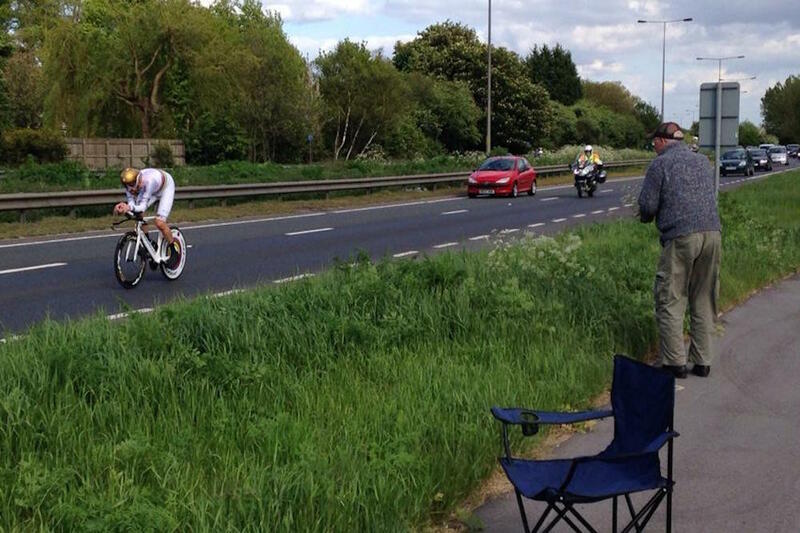 The man given the honour of being Wiggo’s minute man, Andy Birdsall, took the challenge to the world champion, holding the man in the rainbow stripes off for over four minutes and setting a new personal best time himself. Dowsett started his day with a victory of his own in the time trial at Bayern-Runfahrt but kept an eye on proceedings in Hull as he fended off one record attack from Wiggins. Wiggins goes for another of Dowsett’s records on June 7, when the 2012 Tour de France winner aims to beat the Hour Record.